Process stability refers to the consistency of the process characteristics. Industrial cart delivery ensures that the process behaves consistently over time, making it process is stable. Unlike back and forth fork truck ad hoc collection and material flow delivery, Statistical Process Control (SPC) Charts are utilized to determine if the process is stable or not. Some charts are used to assess the stability of the process location, other charts are used to assess the stability of the process variation. Six Sigma and Lean Manufacturing methods suggest that a stable process is a process by which all the causes of variations are known and are acted upon and the process is fairly predictable. Management decisions are not required to further increase the capability of the process. In the absence of such materials flow data metrics outages, downtime, and process instability ensues. Without Fork Truck Free (FTF) material flow process instability results. Empirical evidence creates a commonly accepted understanding that synchronization and stability of material flows impact its productivity. 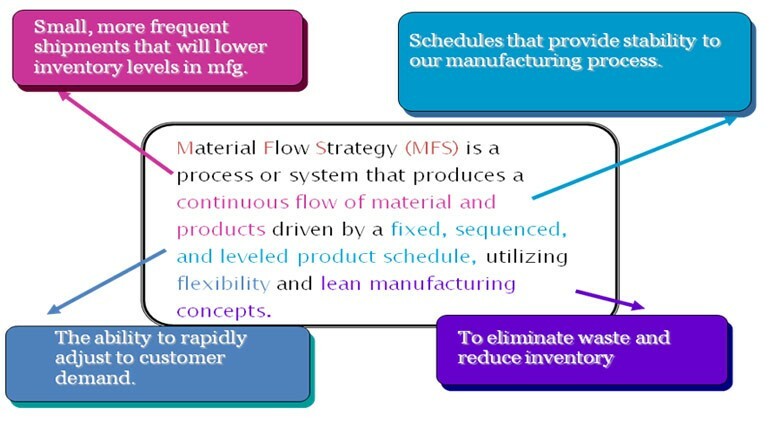 This crucial link between synchronous and stable material flows by time and quantity to create a supply chain with the highest throughput rates is at the heart of lean thinking. Although this supply chain triangle has generally been acknowledged over many years, only cart delivery advances the understanding of these dynamics. A multistage, continuous material flow is modelled through a conservation law for material density. Simple deterministic rules for material flow density allow for numerical simulations to produce the transient supply chain phenomena. The lineside deliver cart modality establishes a clear link between synchronization, stability, and productivity of supply chains.